Democracy is a situation in which everyone is treated equally and has equal rights, in which the people hold the ruling power either directly or through elected representatives. Webster’s dictionary defines what all modern day voluntary organizations already know: that the rights of individuals must be respected, and that each member has an opportunity to express his or her opinion, to attend meetings and to vote. A good election is based on principles that ensure it is free and fair. If every Tenant is treated fairly, equally and with respect during the entire election process, then the methods used are likely appropriate. One vote, one value – everyone only votes once in each election. The elections are based on a simple first-past-the-post system. Tenants elect representatives to speak on their behalf, trusting that the Tenant Reps will say what Tenants would say, and do what Tenants would do. The proper conduct of elections of these representatives is vital to the democratic process. This factsheet looks at the whole of the election process, from the days leading up to the election, procedures for running elections and roles and responsibilities of the individuals who will be involved in making the elections a success. The TPRS ensures that notices about the election is are both letterboxed and posted around each Precinct (or Estate). Other members of the NAB have an important recruiting role to play. Throughout the year, all NAB members should be encouraged to submit the names of Tenants who might be approached by the TPRS/NAB, as well as attending as observers to the NAB. Precinct Reps can also submit interested Tenants names they have in mind, when the NAB is looking for candidates. This policy encourages new people and fresh ideas for the NAB/Precinct. The identification of interested and interesting Tenants is often one of the main hurdles the NAB/TPRS will overcome for the elections. If during the year a list of interested Tenants are collected, then the TPRS will have a much easier task prior to election time. Relying solely on nominations from the floor during elections is not the most ideal practice to filling all vacancies. There are three (or possibly more) options for recruiting Tenants to the NAB. Firstly, to have an open day at various central (hub) points around the Estate to inform Tenants in the precincts about what the NAB does. In both Waterloo and Redfern, this is held twice a year. Thirdly, to letterbox a flyer/newsletter to the Estate about what the achievements of the NAB/Tenant Group have been and to garner interest from Tenants to stand for the NAB. The NAB Terms of Reference and Guidelines for Precinct Reps are the functional framework of the board. It briefly outlines objectives, membership, methods and procedures, complaints procedure and election procedures. In the Terms of Reference, the Precinct Representative tenure is stated. The election process will be overseen by the Central Sydney North Tenant Participation Resource Service (CSNTPRS), who is also responsible for chairing the elections with FaCS Housing staff, or their delegate in attendance. Before the date of elections, the TPRS and/or HCP would have made plans for the coming year including NAB meetings, Community events meetings, information meetings… for each of the 6 neighbourhood areas. As part of these plans, the tentative dates for the elections would have been identified. The elections for the NABs are ideally announced publicly two months before the occasion, usually at the NAB. FaCS Housing is notified, especially if the election takes place in a venue managed by FaCS Housing. 5-7 days before the election, the Precinct is letterboxed by either the TPRS Worker and/or the HCP worker. A successful election depends on voter participation therefore a fantastic flyer announcing the upcoming elections is fundamental to connecting with the Tenants in the Precinct. The flyer should also inform voters so that they understand what the election is for. Letterboxing for an election outside of Waterloo/Redfern is done by the TPRS Worker. The election flyer will also have both a start time as well as a finish time. While a discussion will take place on related issues, such as maintenance, there has to be time management so that the meeting can close on time. Successful and healthy NABs try to ensure that every volunteer position is filled and that there is a good ratio of new NAB members to those who are re-standing. Setup (which may include supplying biscuits and tea/coffee) at the venue that the election is taking place. At the start of the meeting, an explanation and overview of the NAB is given by the Returning Officer, as well as the reasons why there are elections and the process used to achieve the elections. Tenants may stand for the position of Precinct Rep without attending the elections if they have submitted a Nomination form that is seconded and a paragraph or so about why they are interested in standing and what they feel they can bring to the NAB/Precinct. To be elected, though the Tenant submitting a nomination form must be voted in by attending Tenants at the elections. List all names of the nominated Tenants for all to see (or hear). Close nominations by a declaration from the returning officer. Ask each person nominated, whether he or she will stand for the position. If more than two people agree to stand, then each is asked to briefly address the group explaining his or her views on what they can bring to the NAB/Precinct, etc. Voting will be held by a secret ballot unless a show of hands is called for, each Tenant receiving a ballot paper, entering the names of the two candidates (or less) of their choice. Scrutineers distribute and collect ballots, count the votes cast for each candidate and report results to the elections officer. Results are announced, the winners being the two candidates that receive the largest majority of votes cast. Should three candidates end up with equal number of votes (a) the election is declared invalid and moved to a new time or (b) all three candidates are declared elected to represent the precinct. If there are no nominees, then there will be no candidates for election. In this case, nominations are reopened and solicited from the floor. Again, if only one or two people stand, they are acclaimed. If there are more than two nominees, an election is held. But if again no nominees agree to be candidates for the position, then the Precinct Rep role for that Precinct is declared vacant. An Election will be called for the Precinct in the future and the successful candidate(s) will serve for the remainder of the two-year term. The term of office will begin from the date the precinct rep is elected to when the elections for the precinct are scheduled. The Returning Officer then makes sure everyone is informed about the outcome and congratulate all participants for their efforts. Only the authorised Tenants residing in the precinct may vote. If a precinct representative retires mid-term, a letter of resignation should be given to the chairperson of the NAB. As soon as practical after a precinct is declared vacant, an election will be called and the successful elected tenant will serve for the remainder of the two-year term. Notification of the election will be the responsibility of the Tenant Participation Resource Worker. The Returning Officer takes the contact details of the elected Precinct Reps and gives the elected Precinct Reps the contact details of the Secretariat, the TPRS and/or HCP (for Waterloo/Redfern). The TPRS and/or HCP (for Waterloo/Redfern) will then send the newly elected Rep the list of events for the rest of the year, together with all relevant contacts to best represent their precinct. 10.15am What were the NABs set up to do? 10:15am Why work in partnership? Would you like to get involved in your community and be a part of genuine effective outcomes? 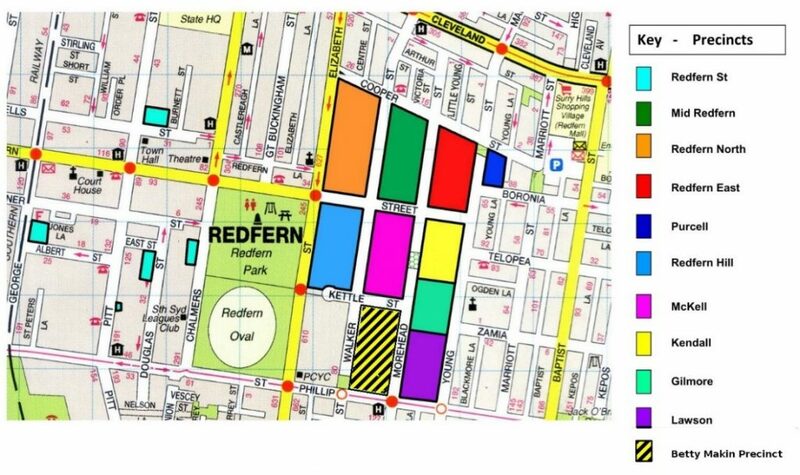 What is the Redfern NAB? The Neighbourhood Advisory Board (NAB) brings together elected Precinct (Tenant) representatives and local agencies to work collaboratively on improving the quality of life on the estates. The NAB meets monthly and members include Tenant Precinct Representatives and representatives from Family and Community Services (FACS), City of Sydney Council, Redfern Police and community services providers. The NAB provides a forum that can facilitate, plan and co-ordinate government and community services on the estate. What do precinct representatives do? The most important role that a precinct representative has, is listening to tenants’ ideas, concerns and issues; getting to know their community. Precinct representatives share these ideas, concerns and issues to the NAB or Housing Standards meetings and report back to their precinct on developments, action or initiatives. As a tenant, being involved is a way for you to raise issues and develop ways to achieve action, change and resolution to problems in Redfern. What has the NAB done in your local area?